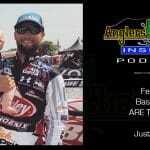 AC Insider: Bass Mafia Elite Series Pro Justin Lucas Talks Daddy Life,LaCrosse, AOY & Oahe Plus News, Wrap-ups, Opinions & More! This week the boys check in with Elite Series Pro Justin Lucas and Life on the road with 7 month old Baby Boy Cooper Jack. JLuc & Jason play “Whats Under the ARE Truck Cap”, he talks Lake Oahe and more! The boys also look back at the Progressive Bass Wrap Up, Costa Countdown to blast off and CB Goes off on Thieves and Idiots. Typical Monday here on the AC Insider Podcast!